Located in a narrow valley in Duy Tan Commune, Duy Xuyen District, Quang Nam Province. 70km southwest of Danang City, 20km away fr0m the Tra Kieu Citadel, and 40km away fr0m the Ancient Town of Hoi An. My Son site is a group of temple-towers of Cham people, an imperial city during the Champa kingdom, an example displaying the evolution and change in culture, a foremost evidence of Asian civilisation which is now extinct. With its great value, in December 1999, the complex of My Son Cham Towers has been recognised as a World Heritage Site by UNESCO. My Son site was an imperial city during the Cham kingdom, between the 4th and 12th century. The construction of My Son was likely to have been started in the 4th century. 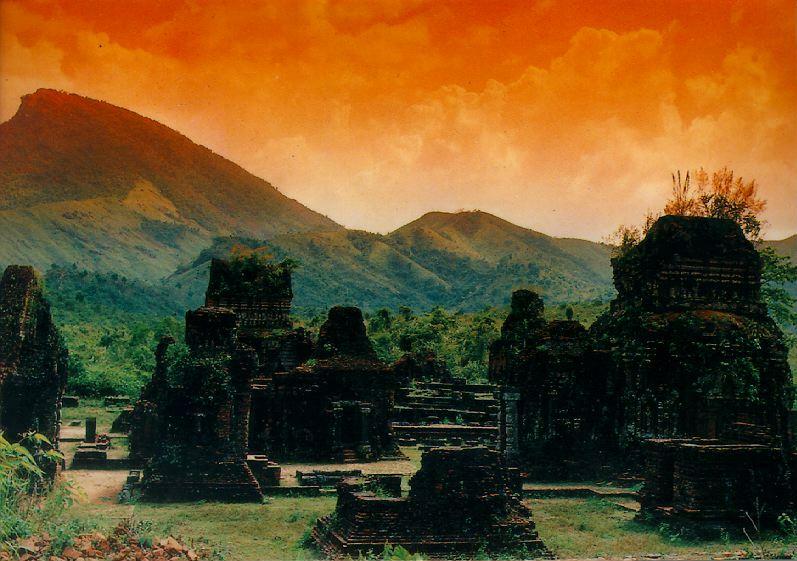 During many centuries, the temple complex had more buildings and stupas constructed of varying sizes and became the main cultural vestige of the Champa civilization in Vietnam. Aside fr0m religious celebrations, which allowed the dynastic royals to spiritually connect with the gods, My Son was also a cultural and religious centre and was the burial place of kings and religious leaders. Through stone stele and royal dynasties, they proved My Son to be the most important Holy Land of the Cham people fr0m the late 4th to the 15th centuries. For many centuries, the Cham built Lip, a mutually linked architectural complex, with baked bricks and sandstone. The main temple worships the Linga-Yoni, who represents the capability of invention. Beside the main tower (Kalan) are several sub-towers worshipping Genies or deceased kings. Although time and the wars have destroyed some towers, the remaining sculptural and architectural remnants still reflect the style and history of the art of the Cham people. Their masterpieces mark a glorious time for the architecture and culture of the Cham, as well as of Southeast Asia. According to many researchers of the ancient Cham towers, the architectural art of the Cham towers at My Son Sanctuary is the convergence of different styles, including the continuity of the ancient style in the 7th-8th centuries, the Hoa Lai style of the 8th-9th centuries, the Dong Duong style fr0m the mid-9th century, the My Son and My Son-Binh Dinh styles, etc.